The center of my entertainment. One of the concessions I was willing to make when taking the plunge and living on my own was not getting cable. At home, it always was convenient to turn on the tube and surf to some show I was mildly interested in (don’t get me started on my ultimate guilty pleasure, Ghost Adventures marathons). But that was the problem — everything was only mildly interesting. The saying “I have 200 channels and there’s nothing on” is a saying for a reason. Nine months later, I’m still alive and fairly satisfied with my decision to live cable-free. I accomplished this lifestyle choice with the help of a few devices. • AppleTV. More than anything else, the little internet-streaming black box has filled my entertainment need. It contains plugins for Netflix, Hulu Plus (each $8 a month) and connects to your iTunes library. Before I moved, I made an effort to convert as much of my media library to digital format as possible, which now leaves me with hundreds of hours of on-demand content (sadly, I didn’t have any Ghost Adventures to bring along with me). And, if you’re an Apple fanboy like me, AppleTV lets you rent and buy movies from the iTunes store, giving you access to new content without going to the video store. But, if you’re an Apple fanboy who acknowledges that Apple is not the end-all be-all of entertainment and likes to bend the rules a little like me, you’ve done a little hacking to your AppleTV and installed some special plugins that allow you instant on-demand access to any TV or movie… ever. Hello, Dexter. • Blu-Ray player. Physical media is dead, but whatever. Of course you need one of these. • TV antenna. I used to be able to pull in most of the networks through the clear QAM in my cable. But, since the RCN bastards decided to scramble it a month ago, I was deprived of my ability to watch Wheel of Fortune at dinnertime. Something had to be done. 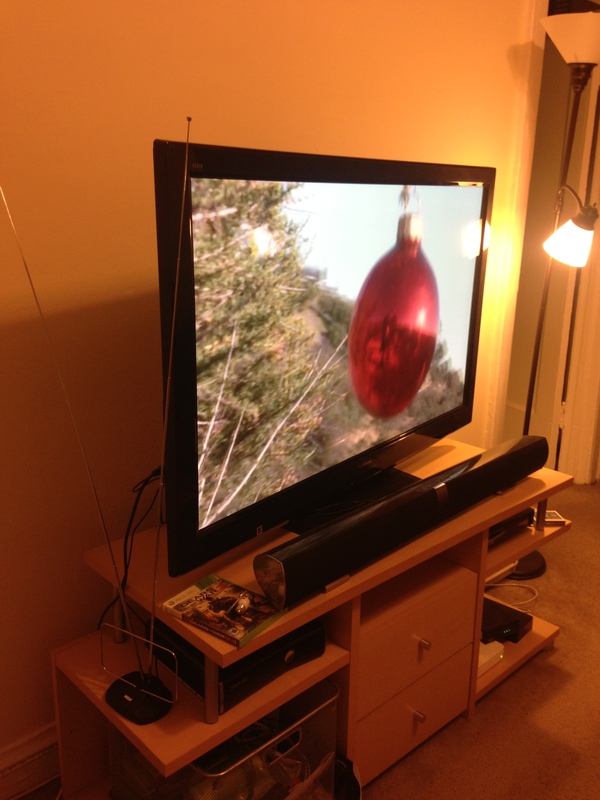 So I picked up an $11 antenna at Best Buy and now am once again able to watch the Wheel… and not much else. Since I’m only able to pull in three channels, I was watching The Bachelor after dinner one day (it’s on after Wheel) and had a literal ‘OMG’ moment when I spotted a girl I went to high school with as a contestant on the show. And this star-struck moment only could have occurred because of my cable-deprived lifestyle. So, do I still miss cable? A little. Honestly, I mostly liked it to have some background noise while I did something more important. My three networks — ABC, WPWR and WCIU — fill that void now. Will I splurge and get cable if I end up getting a raise and have some extra cash? Possibly. It’s been a while since I’ve seen Ghost Adventures. ← Fa la la la la, la la K’Plah!